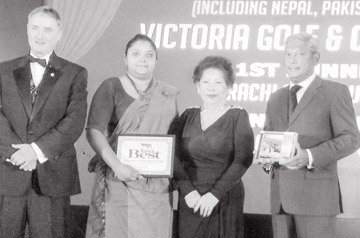 Victoria Golf and Country Resort underlined their reputation as one of the best golf courses in Asia when it brought honour to Sri Lanka by winning the award as "Best Golf Course in the Sub-Continent" in the competition organised by the Asian Golf Digest. The presentation of award ceremony took place at Marina Sand Bay Hotel in Singapore this last week. Two officials from victoria golf and CR who went to collect the award second from left Dhanushika Medagoda (Marketing Manager) and on extreme right Neroy Marso (General Manager). It was a truly top honour and recognition for Victoria Golf course for having won this award for the 8th time since the year 2006, which means they are heading this list and have taken up an unbeatable lead. Winning 8 times out of 9 is a great achievement which is worthy of mention. The odd year they could not win this was won by Royal Colombo Golf Club two years ago and this time RCGC was placed third while the second spot was occupied by Karachi Golf Club, Pakistan. Success did not come Victoria's way easily and it was not offered on a platter and it was sheer dint of hard work and dedication tot he task by its staff headed by its amiable General Manager Neroy Marson, the Course Manager Indu Rodrigo and the support staff who worked tirelessly in the hot Sun and the wet weather conditions often accompanied by thunder and lightning. The other important aspect of marketing and conducting events was handled by a young lady Dhanushika Medagoda. Then there is the Restaurant staff and the Caddie Master S. Siva who were all responsible for this great success. A tribute must be also paid to the earlier members of the staff who played a key role for the success of the maintenance of the golf course and its activities. The First Director/General Manager was Tony Witham, followed by Mike Varney, and Errol Johnston who did tremendous amount of work to upgrade the facilities from time to time. The present General Manager Neroy Marson himself a golfer with a low handicap with years of experience in Star class hotels is continuing the good work or even better as evidenced from the comments of the golfers from both Sri Lanka and abroad. Some of the others who had contributed to the success of the club are Mrs. Janina Weeratunga (An English lady who settled down in Sri Lanka), S. De Run, Lalindra Ranaweera, Peter Perera, and the present Finance Manager Nishantharana. It is a matter of conjecture whether this golf course was born by accident or whether it came into being through design. Its founder the late Mark Bostock during one of his visits to the Victoria region saw a potential of a golf course being constructed here. West part of the area was surrounded by the Victoria reservoir and skirted by the hills of the Hewaheta Range, the Hunnasgiriya Ranga and at a distance the Hanguranketha Range. The Victoria dam which was commissioned a few years earlier could be also seen from a little higher elevation. 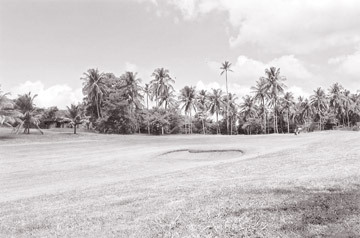 It was in the mid-nineties and the ethnic war was having its tell with the tourists reluctant to come to Sri Lanka and Mark Bostock conceived the idea of constructing an International class golf course with all facilities like any other top golf course in the world to attract not only golfers but also others to make Sri Lanka a golfing and tourist destination. This land was owned by the State and was a coconut plantation. With much persuation the leasing process was overcome but there was a problem with the anvironmentalists and the Trade Unions. Late Mark Bostock using his wide experience in both as a planter and administrator and a professional employed brilliant strategy. The trade unions were told that line rooms located in the middle of the area earmarked for the golf course will be re-located else and provided with cottage type houses with a 40 perch block of land thrown in as a good measure. They will also find lucrative employment in the golf course and 100 such line room dwellers were re-settled at a huge cost. The theories of the environmentalists were also debunked as there was no foundation in them as a environment friendly golf course was to be constructed while retaining the nature. The best in the world Donald Steel - a world renowned Golf Architect designed the golf course and the job to implement the designs and plant the grass was entrusted former planter and cricketer Tony Witham who was working with the Melbourne Parks came ever to Sri Lanka handle the implementation of this project. Tony Witham now retired from the services of Victoria's golf complex said that he had to face a number of labour cases which they won all. There are two more pending in the Labour Tribunal. It was a 18-hole golf course designed for 36 holes and built up to USGA standards it has been ranked among the first 100 golf courses in the world since it was opened to golfers in 1999. The first golf championship to be conducted was Donald Steel golf championship and other top events have been Sri Lankan Airlines Golf Classics, Mark Airways Golf Classics, SAFF Games Golf championship, Sri Lanka Amateur Golf Championship, United Arab Emirates - Sri Lankan Golf Championship, the Club Championship, the PGA Masters Golf Championship, Junior Championship, and many others. There is also the monthly medal competition. Apart from golf then there is a chain of chalets which enjoys a very rate of occupancy, the swimming pool, table tennis, horse riding, mountain hiking and a well equipped restaurant with air conditioned facilities. For wild life enthusiasts there is plenty of small and friendly wild life sambhurs, egrets, many varieties of birds etc. This golf course offers a feast for the senses with fairways lined with mara trees, coconut palms, the plains the outcropping of hills the scenic beauty in sylvan surroundings will make this course a golfers paradise and they will be playing in the paradise no doubt.